League of Women Voters of Texas Voters Guide is available before early voting in statewide elections and is provided in both English and Spanish. Visit your local League of Women Voters website for local voting & election information. Find your polling place, compare candidates, or print a ballot at VOTE411.org. The League of Women Voters never supports or opposes candidates for office or political parties. Any use of the League of Women Voters name in campaign advertising or literature has not been authorized by the League. The LWV Texas Voters Guide is nonpartisan & unbiased. We list candidates in contested races who are on the election ballot and provide their answers to questions posed by the League of Women Voters of Texas Education Fund. 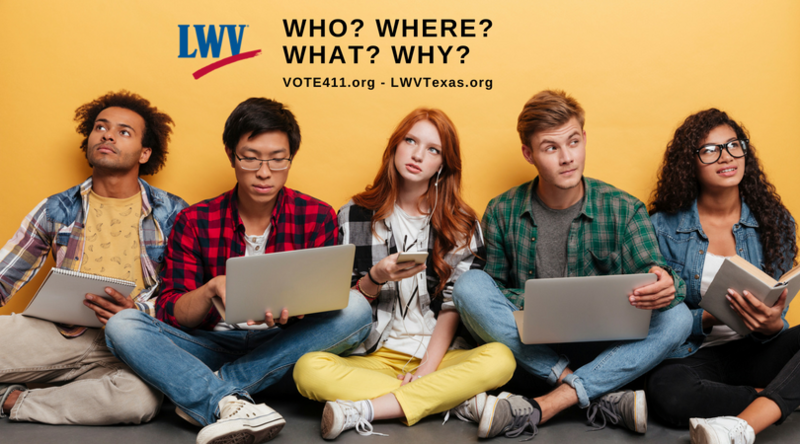 The LWV Texas Voters Guide covers statewide candidates, State Board of Education, Supreme Court Justices, Court of Appeals Justices and US Representative and Texas House Rep candidates that did not have a local league. Each candidate was emailed three times during production. If a candidate did not respond they may still be added to our online Voters Guide at VOTE411.org. You may print the Voters Guide to bring into the voting booth! Note, however, that mobile phones are prohibited in the voting booth, so be sure to bring what you need on paper, not on your phone. An interactive version of this Voters Guide is available online at VOTE411.org. Enter your address and zip code and view the races and candidates that appear on your ballot. You will be able to compare the candidates’ responses to the questions and create a printout of a ballot that you can take to the polls. Support the Voters Guide with a tax-deductible contribution to the League of Women Voters of Texas Education Fund, 1212 Guadalupe # 107, Austin, TX 78701 or make a secure donation online.